Yes, I'm a retrogrouch about to get on my high horse. Remember when cars of the 80's turned to garbage, I think we're there again with bicycles. Of course my taste is classic, but whatever happened to aesthetics and art? I believe we're firmly within a period of very ugly machines. It seems that everything went kinda bikepacky overnight. I see overbuilt steeds posted everywhere with bizarre shapes and stems, laden with all sorts of frame bags sticking out like tree branches, yet commenters ring in with likes? God awful straight bladed unicrown forks. Bubble gum welds are okay as long as the brand is hip. Just saw a seatpost so tall it had room for a bottle cage. Top tubes sloping down enough for long dresses. Handlebars of every shape and hideous size. Monster water bottles completely out of proportion. And of course the disappearance of my beloved shiny parts to make room for the "noir" options. Just scrolled through a popular Instagram feed where fat tires are pushed and saw roughly 1 cool classic-lined ride for every 7-8 modern looking things that put me to sleep. I know, it might be just me. I adore tan sidewalls, however they look so fugly bulging through modern sloping carbon frames with 11 in the back and no fenders. You give up a lot to go supple. Another formerly Francophile site that's gone this way is also pushing the heavy duty mountain bike as a road bike. Or just hybrid-ize everything else into a $3,000 grocery getter. Does anyone ride pavement any longer? Is the drop bar also getting dropped. I just can't put a Wald basket on an $1,800 frame only for a variety of reasons. Let's add maybe no more derailleurs? Occasionally when I go in LBS to get consumables, I stroll around and look at the bikes. A lot of aspects just seem to look cheap to me, like chain rings. Maybe they are light and high performance to justify cost, but just look fragile and blah to me. I try to keep an open mind . . . But I always appreciate the beauty of a lugged steel bike. Even my brother is starting to buy and ride more modern bikes than C&V bikes! 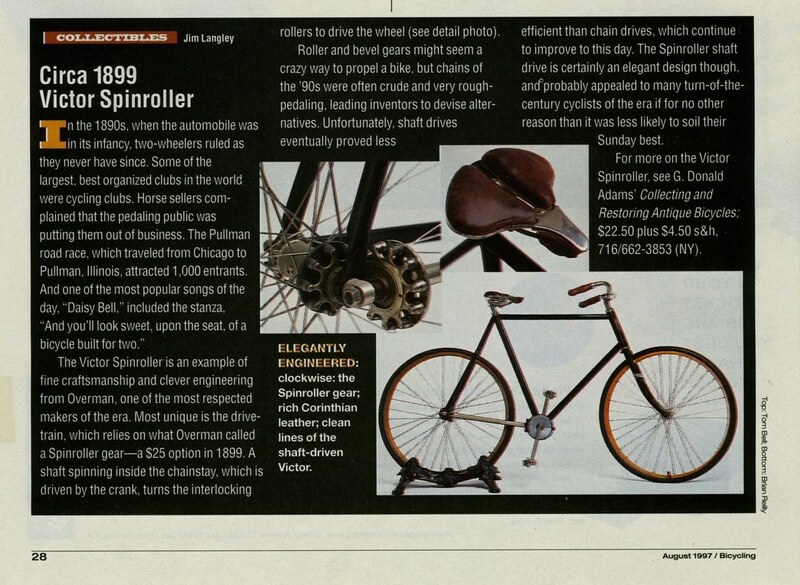 “Advancements in drivetrain technology have been evolutionary since the 1920s. Driven is truly revolutionary given its unique rolling element power transfer and unmatched efficiency." I'm not sure how much drivetrains have evolved since the '20's, but this idea predates the 20's by another twenty years. I do have to give Ceramic Speed credit for using tiny ball bearings instead of the simpler bushings used in the Victor. And those disc brakes have been around awhile too. What is old is new again. Man's brain is finite the way we use it, and recycled ideas long forgotten are given life as revolutionary developments. We are a limited species. I'm confused. Shimano is still the market leader on decent road bikes, and their cranks are extremely beefy. I probably won't be around in, say, 2068 when someone posts on the C&V forum that they are looking for parts to restore THAT thing. One thing that will surely have many vintage bike aficionados buying newer carbon bikes is their rapidly increasing presence on the used-bike market. Maybe an old Vitus or Epic has crept into your collection after prices fell to a certain point(? 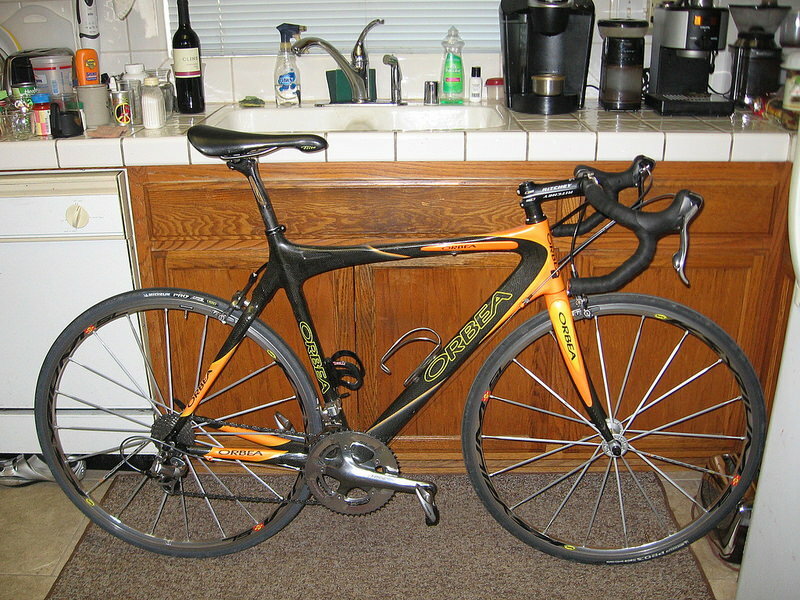 ), but even solid pro-tour bikes like my Orbea Orca turned up four years ago for just $700 with full Dura-Ace 10s and Ksyrium wheels. They might ride a little stiff, but if the bike takes 25mm tires then usually one can adjust pressure to suit road conditions. Their hidden cables and ability to handle 28mm tires are two of the main features distinguishing today's contemporary bikes, so low-mileage, high-end bikes with exposed cables and only 25mm tire capability are going quite cheap right now! This barely-used 2010 NOS Argon18 frame built up with 9100 gruppo and R-Sys carbon-spoked wheels came to me just last week for only $1300 and weighs 15.2lbs without pedals. At least it's not black! But the steel bike bargains still turn up, only in smaller numbers these days it seems. You could blame Surly. They started with an ugly trade name and deliberately created ugly logos to emphasize it. From a brand identity point of view, it made perfect sense to paint their bikes various shades of faux primer. For some reason, brands with nicer trade names followed suit. Pathetic. Yet just across town, QBP sister division All-City is applying classically beautiful paint jobs and nice headbadges. I'm hopeful All-City will start offering polished aluminum soon. Perhaps it might catch on. Mehhh,..... my 86 Vitus Plus Carbone 7 now weighs in at 16 pounds.....with pedals! Amen, 15lbs is yesterday's news, but the bike is solidly engineered, even has an adjustable headtube length so the top bearing is always up near the stem (shown with max height spacer). FWIW, I added an unfashionably soft saddle, an SDG Bel Air, and the gearing goes down to 34-30t which makes it pretty unstoppable. I warmed up to the Canadian weird-tech graphics right away. Sorry, but it's been a carbon-bike weekend for me, testing all of my existing ones to decide on whether the Argon18 could be fitted properly to me and thus would be coming on board. I'm not necessarily disagreeing with you, but most of the current trend seems to be less about what you're riding than where you're going or where you've been. Aspirational is as important as functional, lots of people riding full on bikepacking rigs that will only see pavement and never ride more than a couple dozen miles at a time. Same as the guys who toodle on the bike path with their negative bar drop cervelo decked out with p-clamp rear rack. As far as trends go I think I like this one better than the roadie trend, the landscapes are much more interesting and while the bikes may be ugly they are usually visually unique enough to hold my attention for a least a little bit. How many pictures of road race bikes pictured in front of a gently curving country road do I need to see in a lifetime? I thought that the "new" was unique and a great idea...what's old is new again. I wonder what the reason was that it never caught on? Innovation, testing and change are always good IMHO. Not only the bikes. Watching a bit of the TdF...ugly. jerseys, shorts, white shoes, and those ridiculous helmets. Froome looks horrendous on a bike. No interest in modern cycling. I'll stick with my memories and all the great photos of real cycling pre-1980. And what about those few years in the late 80's/early 90's when they were selling lots of jerseys with ugly "batik" style prints and even paisleys?? YARF!! Last edited by Chombi1; 07-09-18 at 09:57 PM. Froome looks horrendous on a bike. That has nothing to do with the bike, he is widely regarded as ugly on any bike. Best description I've heard (during the Giro this year) was, "washing machine." Totally appropriate. What an excellent use of High Horse time! 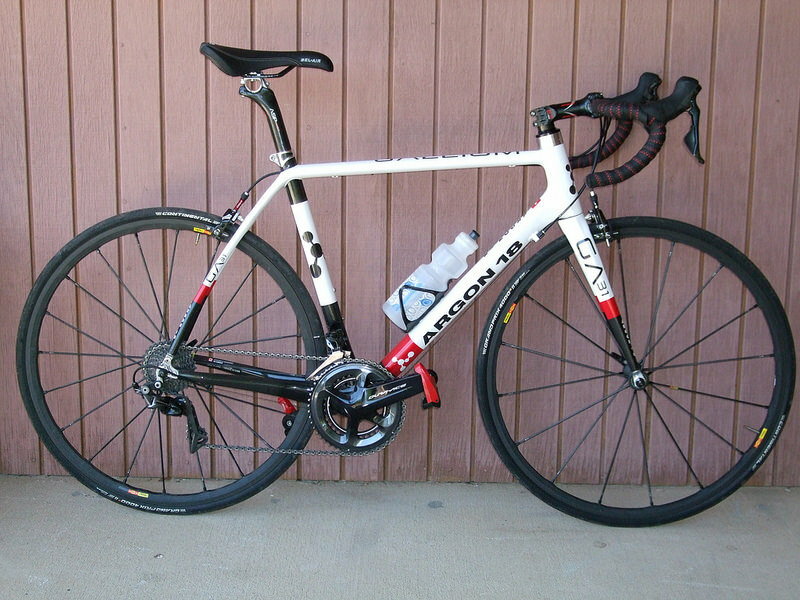 @dddd you got a killer deal for a 9100 Dura-Ace (dang it!!!) equipped bike. Looks great. At 33, I'm old enough to appreciate vintage ('80s mostly), but young enough (esp. as a designer) to like a bit of the new stuff, so I'm totally ruining this. I'm a road bike guy through and through. Car or truck? Car. Race frames, touring frames, I have never liked mountain bike frames--the new ones, while immensely capable, are brutal in their overt function = form aesthetic. The bike-packing thing, while also clever and of value (to others) with its Swiss Army Knife-like ethos....I just really freakin' love lugged steel construction! The classic components and resulting aesthetic are so very nice, but practically speaking, for cut-and-thrust city commuting/riding, I've upgraded nearly all my vintage frames with (shiny!) newer pieces so as to be able to stop, go, and climb much easier whilst enjoying the classic look, geometry, and comfort of vintage steel. To sum it up, I feel ya. Even as a designer, a good bit of the new stuff lacks that "this will still look good in 10-20 years" design ethos, which is too bad. Maybe, we'll never know. I hope to be around in 20 years, so I'll let you know what mixing and matching happens then! With that in mind, my guess is that much of what we see as new, today, will one day become old, then antique or vintage and some fool (like me) somewhere (like Thunder Bay) sometime (probably in twenty years) will want we scoff at today. I read that in Jordan Peterson voice. For sure we have our reasons why we prefer anything. For me it's when I got interested in cycling, the 80's. Greg Lemond, Bernard Hinault, etc. I just prefer the look of that era. Modern slanted tt, carbon etc, looks odd. In fact a good CL deal on a modern bike simply means my lugged steel bike can get an upgrade. But to each his own and more power to you for choosing to ride in the first place.